Western blot analysis of extracts from various cell lines using Fascin (55k-2) Mouse mAb (upper) and β-Actin (D6A8) Rabbit mAb #8457 (lower). 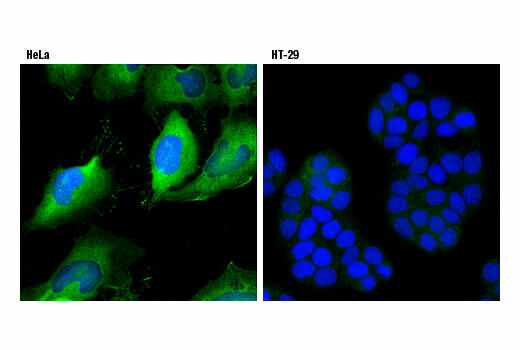 Confocal immunofluorescent analysis of HeLa (left) and HT-29 (right) cells using Fascin (55k-2) Mouse mAb (green). Blue pseudocolor = DRAQ5® #4084 (fluorescent DNA dye). 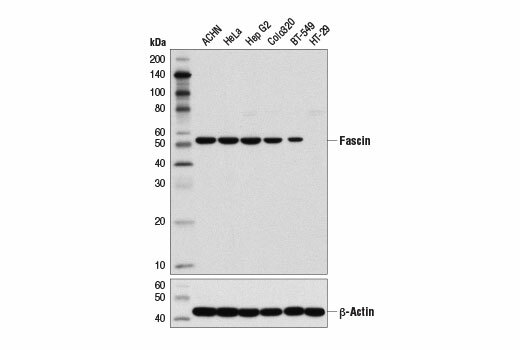 Fascin (55k-2) Mouse mAb recognizes endogenous levels of total fascin protein. Monoclonal antibody is produced by immunizing animals with fascin protein purified from HeLa cells. Fascin is a monomeric, globular protein that plays a central role in regulating the structure and function of the cortical actin cytoskeleton (1). Fascin promotes cross-linkage of parallel actin filaments during the formation of cell protrusions (lamellipodia and filopodia), and therefore plays an important role in regulating cell migration (2). It has been reported that fascin may also regulate filopodia formation by a mechanism independent of its actin-bundling functions (3), though less is known about this mechanism of action. Research studies have shown that increased fascin expression is associated with increased motility and invasiveness of neoplastic cells, including breast, colon, prostate, and esophageal squamous cell carcinomas (4-6). Fascin binds to the armadillo-repeat domain of β-catenin in vitro and in vivo, and has been shown to co-localize with β-catenin and cadherins at the leading edge of migratory cells (7). Hoelzle, M.K. and Svitkina, T. (2012) Mol Biol Cell 23, 310-23. Adams, J.C. (2004) Curr Opin Cell Biol 16, 590-6. Zanet, J. et al. (2012) J Cell Biol 197, 477-86. Hashimoto, Y. et al. (2005) Int J Biochem Cell Biol 37, 1787-804. Stewart, C.J. et al. (2012) J Clin Pathol 65, 213-7. Alam, H. et al. (2012) BMC Cancer 12, 32. Tao, Y.S. et al. (1996) J Cell Biol 134, 1271-81.